(Nanowerk News) An international research team have successfully converted graphene - sheets of carbon just a single layer of atoms thick - into its hydrogenated equivalent, graphane. 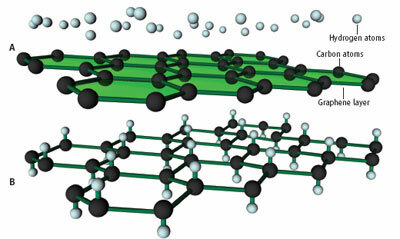 The scientists, from the UK, Russia, and the Netherlands, say that graphane's electronic insulating properties complement graphene's conductivity, boosting the prospects of graphene-based nanoelectronics and hydrogen-fuel technologies ("Control of Graphene's Properties by Reversible Hydrogenation: Evidence for Graphane"). The work is the first to shows that a chemical approach can be used to tailor the properties of a nano-material like graphene, in order to tune it to a particular application, says Andre Geim, part of the team at the University of Manchester. The team used a stream of hydrogen atoms to reversibly convert graphene into graphane. Geim and his colleague Kostya Novoselov led the researchers who discovered the first simple approach to make graphene in 2004. Graphene's layer of delocalised electrons gives it remarkable conductive properties, which has since fuelled the idea of creating superfast nano-scale transistors. But one of the biggest obstacles of using it for such applications has been to understand how to control electron flow. One possibility previously explored by Geim and Novoselov has been to cut graphene into strips only a few nanometres wide. However, 'you can never really stop current flowing when you want to,' says Geim, because graphene lacks the necessary energy gap in its electronic structure. But graphane offers a possible way around this problem. 'What graphane brings to the game is the possibility of chemically modifiying the structure of graphene to open a gap,' says Jorge Sofo, Professor of Physics at Penn State University, US, who hypothesised the existence of a fully hydrogenated version of graphene in 2007. 'Imagine if you were able to produce a single, transparent plane of graphane - essentially a plastic - and imagine having a magic pencil with which you can remove hydrogen so you will be drawing a channel of graphene.' Sofo says he is now working with colleagues on how to create such a 'pencil', possibly with some kind of scanning tool.